It has only been in recent years that Sri Lanka has opened up to general tourism. The civil war that ravaged the country for decades had kept people away but the situation in the country has improved dramatically since the conflict ended in 2009. The effects can still be felt today, though. There’s no danger or fighting anymore. It’s more about what’s missing. While other countries in Asia were expanding their tourism offerings, Sri Lanka was making virtually no investment for the 26 years of the war, between 1983 and 2009. It means that, coming to Sri Lanka, you’ll find that there isn’t the tourism infrastructure that you would find in Thailand or India. It also means that you may not know where to start with your travel planning. You haven’t heard stories from friends and family for years about all the best places to visit and things to do. If you are like I was before my first trip, maybe you don’t really know anything about what there is to see in Sri Lanka! Well, I’ve been to the country a couple of times now and so wanted to put together this guide for you about the best things to see. Think of it as your basic entry-level information about some of the main sites and regions that you’ll want to visit on your first trip to Sri Lanka. Hopefully this helps you get a bit of an understanding about what the country has to offer. I have marked the ten places that I’ll tell you about on this map so you’ll have a visual reference to help. I’ll also include some basic practical information for you about visiting each of these places. OK, let’s get right into it! If you are interested in seeing some of the historical sites of Sri Lanka, then the best thing is to start your trip by heading into the centre of the country, to an area referred to as ‘the Cultural Triangle’. The first site you’ll come to is the Dambulla Cave Temple. From the road you’ll see a large golden temple but don’t be fooled – this is a relatively modern construction. What you need to do is take the long path up to the top of the mountain to see the main attraction. Within a network of natural caves, worshippers have built a series in incredible shrines and temples. Lining the walls are Buddha statues of all different shapes and sizes. The ceilings and walls are painted and stupas sit inside the largest caverns. I would recommend using one of these tours to visit Dambulla from Colombo or Negombo. There are 157 statues in total and they were first installed in the 12th century. It’s quite an eerie feeling to stand inside the caves and have them all watching you. Where should you stay in Dambulla? The best budget option in town is the, Dambulla City Hostel. For a friendly hotel at an affordable price, try Hotel Gala Addara. One of the area's nicest hotels with an incredible landscape is Jetwing Lake. And if you want a treat at a relaxing retreat, you won't find better than Kalundewa Retreat. 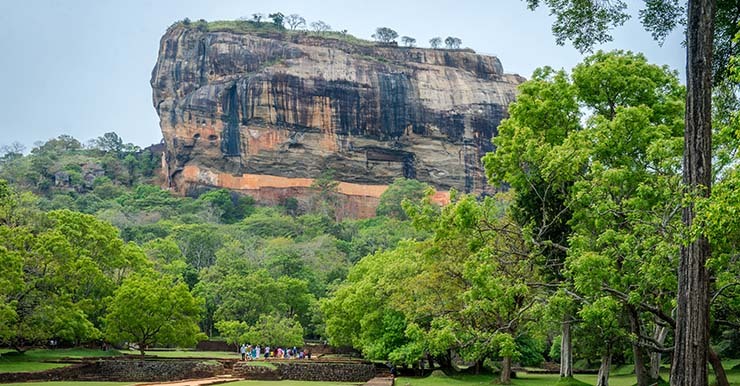 The most famous site in the Cultural Triangle is Sigiriya. It is a fortress that was built on the top of an enormous rock about 1500 years ago. Around the base of the rock was a large city and the ruins are still here. 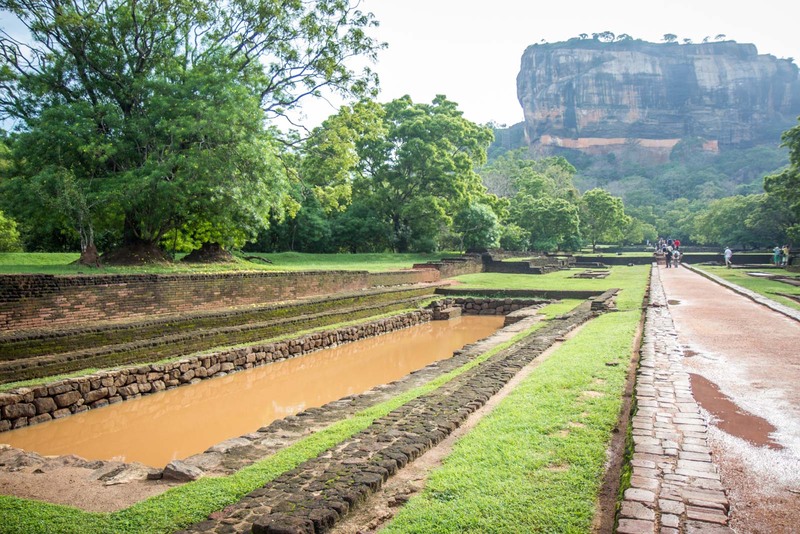 There’s an interesting story behind Sigiriya. It was built by a man who killed his father, who was the king, and then stole the throne from his older brother. He was so scared of revenge that he made the new capital at the top of the rock so he would be more protected. You can take the stairs and paths up to the very top of Sigiriya and it’s an impressive site. Along the way, you’ll see different parts of the ancient capital city and some impressive art in a cave on the cliff. Where should you stay in Sigiriya? If you're looking for budget options, Fresco Lion Villa Hostel is a really cool place but a bit out of town. And Sigiriya Hostel has a much better location. There are lots of affordable and comfortable homestays in the area. Have a look at Sigiriya Amenity Home Stay, for example. A wonderful but affordable four-star option that I would recommend is the Cinnamon Lodge Habarana. And for an absolutely stunning hotel, you can't go past Jetwing Vil Uyana with special bungalows. As well as culture, Sri Lanka has a lot of natural wonders to offer. I’ll be talking about a few natural sights in this guide but I think the most impressive one is seeing the herds of elephants in the wild. Elephants are an important part of Sri Lankan culture and you will probably come across some that are chained somehow. That’s why it’s so refreshing to see them in their natural habitat, in large groups, usually with a few babies amongst them. The two most popular parks to see the wild elephants are Minneriya and Kaudulla. The only why to get inside is with authorised jeep tours. The guides know the best places to go and how to behave around the animals, so it’s a safe and really cool experience. The jeep rides leave from various locations around the Cultural Triangle. 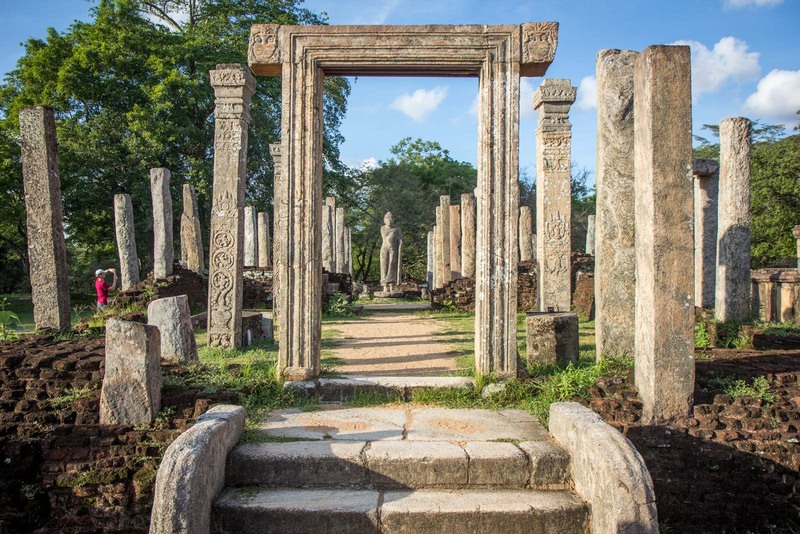 Also within the Cultural Triangle, although a little further away from the other sites, is the ancient city of Polonnaruwa. It was once the capital and is full of the remains of impressive civic and religious buildings. Most of the site was built between the 10th and 12th centuries and there are some similarities to the Khmer temples at Angkor in Cambodia, These ones, however, are not nearly as large. The highlights are spread across quite large area, although it would be possible to walk between them. You are better off with a bike or tuk tuk, though. However you do it, make sure you don’t miss the incredible Buddha statues at Gal Vihara. Where should you stay in Polonnaruwa? If you're looking for a budget option, Livinginn Polonnaruwa has a lovely green feel to it. A cool modern hotel at a reasonable price is My Home Guest. For a lovely boutique hotel with a pool, I would suggest Thidas Arana Hotel. And if you feel like treating yourself, Ekho Lake House is a really beautiful place. South of the Cultural Triangle and higher up into the mountains is the city of Kandy – the largest outside of the capital region. It has a charming feel to it, despite the busy streets, with a mountain vibe and a thriving cultural centre. 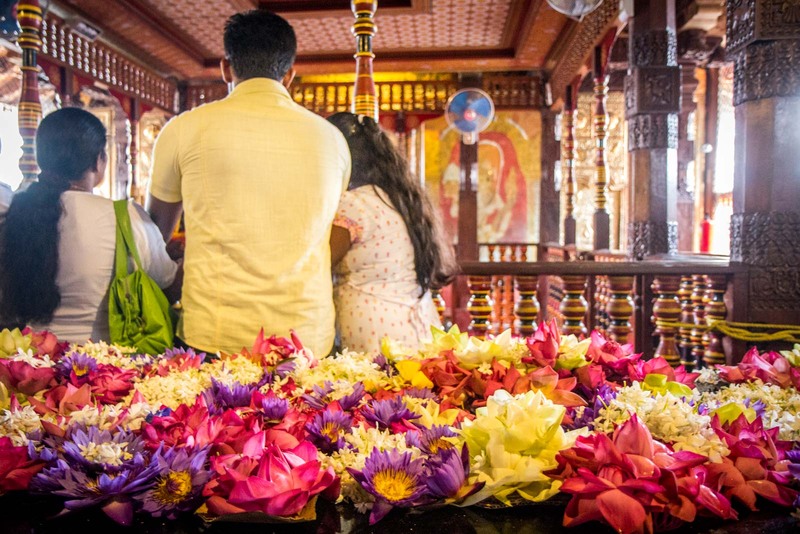 The most important site in Kandy is, without doubt, the Temple of the Tooth (officially called Sri Dalada Maligawa). It is an important pilgrimage site because it is said to house a very special relic – a tooth of Buddha that was brought to the island in the 4th century. The temple was certainly a critical location for the spread of Buddhism from India to Sri Lanka. There are several ceremonies each day when the building fills with locals bringing offerings. Both the city and the temple are busy and loud but always colourful and fascinating! Further south and even higher in the mountains is the city of Nuwara Eliya. You’ll notice even before you get there that this is the tea region of Sri Lanka, with tea plantations lining both sides of the road for at least an hour before you arrive. 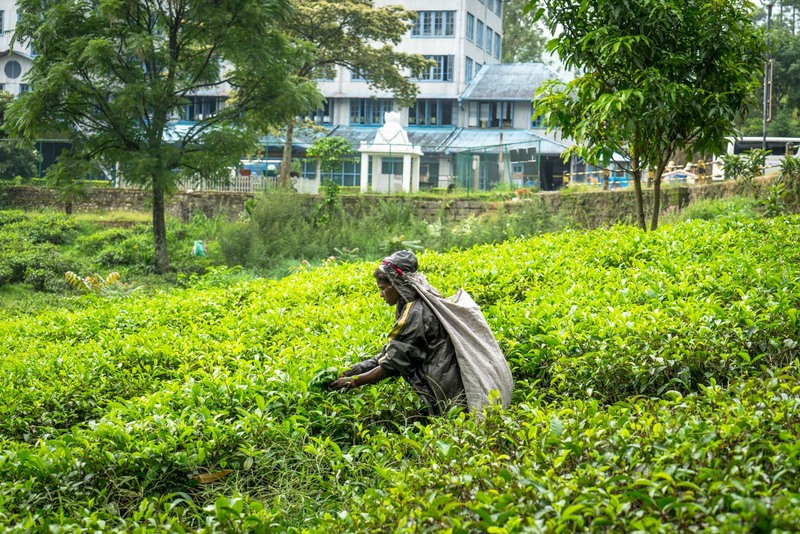 Nuwara Eliya has a distinctive British colonial feel because it was founded by the British in 1846. The location was chosen because it had the right environment to grow tea. But it was also an escape for British colonialists in other parts of the country, who would come here to play cricket, hunt for foxes and other hobbies from home. The city is interesting to explore but can be done relatively quickly. 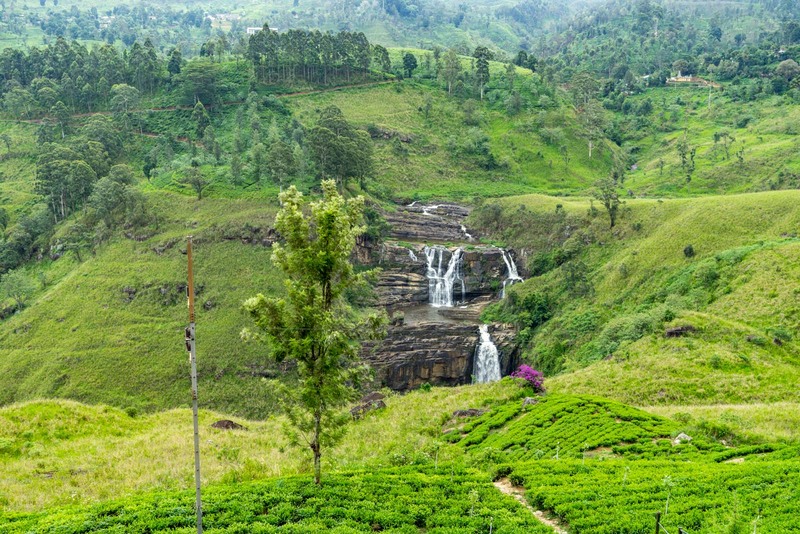 Nuwara Eliya is particularly worthwhile as a base to visit tea plantations and see a different side of Sri Lanka. Where should you stay in Nuwara Eliya? If you're looking for something budget, the Hi Lanka Hostel is your best option. For a friendly homestay at a great price, have a look at Nuwara Eliya Homestay. One of the area's nicest hotels is Jetwing St Andrews in a unique property. And if you want stunning accommodation in a colonial mansion, have a look at Brockenhurst Bungalow. Near to Nuwara Eliya is the natural World Heritage Site of Horton Plains National Park. 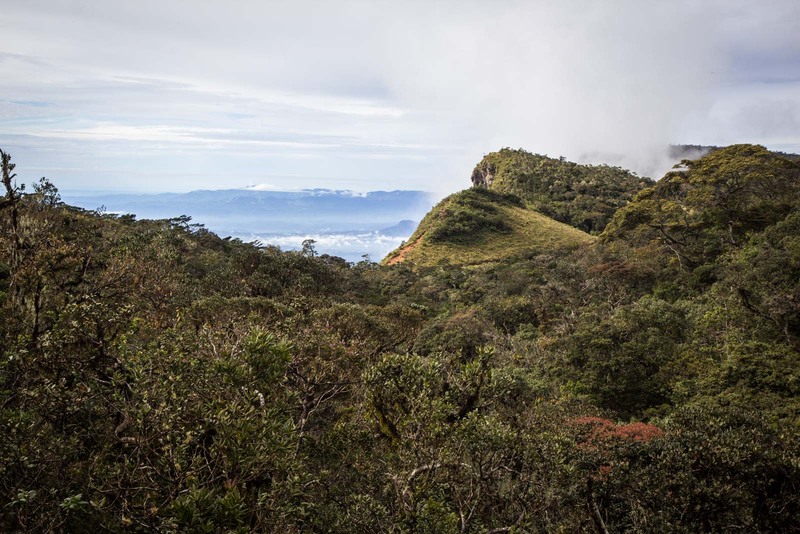 It’s been added to the World Heritage List because of its unique ecosystem with so much flora and fauna that it’s been described as “a super biodiversity hotspot”. For visitors, though, the highlight is the ‘End of the World’. It’s a cliff 1200 metres high that gives you incredible views across the region and even to the ocean 80 kilometres away. The whole area gets covered by mist from mid-morning onwards so most trekkers get up before dawn to do the 5 kilometre walk there. As well as the viewpoint, there are lots of animals to be spotted on the walk (which people normally do as a 9 kilometre circular route). In particular, you’ll notice birds and lizards all along the way. 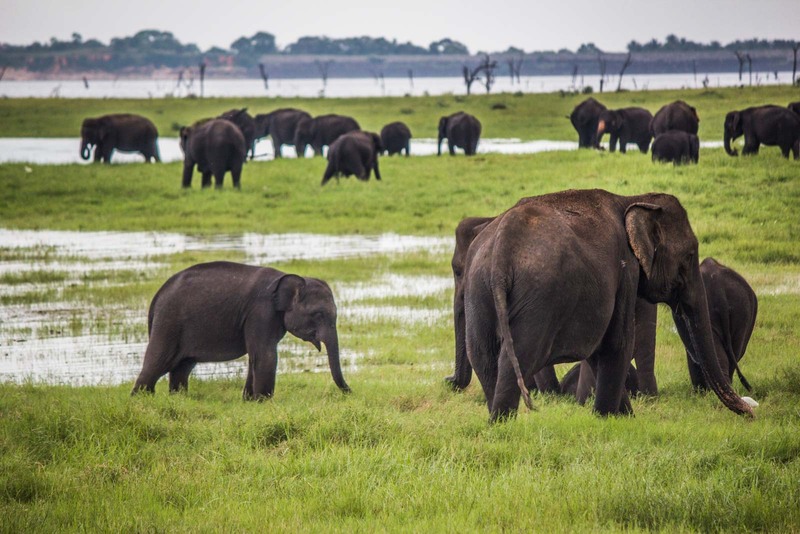 Probably the most touristy natural site in Sri Lanka is Yala National Park, which has gained a reputation as the best place to see animals in the country. That may not be strictly true but it is certainly the most accessible and has good facilities for tourists. There are elephants, bears, buffalo, loris and macaques. But the highlight is the leopard. Yala National Park is said to have the highest density of leopards in the world… but there are still only 35 so you have to be lucky to spot one. While I am a big fan of culture and nature, I know that some people just prefer to have a relaxing beach holiday. The good news with Sri Lanka is that you can do both. The popular beaches are found along the southern coast of the country and are all easily accessible (by train from Colombo, for instance). Mirissa is one of the largest and is very easy, Bentota has a lot of development but is still pretty quiet, Weligama has only limited infrastructure but stunning views. Or you could base yourself in Tangalle and explore the beaches around it, or stay in Unawatuna, which is right next to Galle. 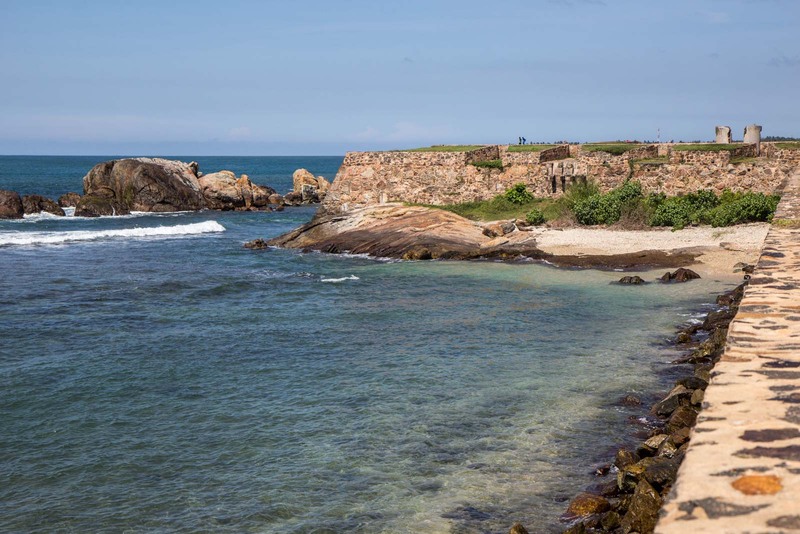 The city of Galle is a beautiful old fortified town on the southwestern coast of Sri Lanka that shows the history of European involvement with the island. Galle was founded by the Portuguese in 1588 and the earliest styles still visible are from this period. However, the Dutch claimed the land in 1640 and they built strong walls along the sea to protect against attack from the water by European rivals. They redeveloped a lot of Galle and that’s mostly what you can see today when you walk the streets of the old town. The architecture is interesting but this is also a good base to explore some of the beaches along the coastline. Please let me know in the comments below if you have any questions. And I hope you have a fantastic trip in this beautiful country! Wow! it looks amazing places in these photographs, i have never taken Sri Lanka from this point of view. Thanks for sharing this information about the Sri Lanka. Sri Lanka itself is a beautiful country. Its famous for its beautiful beaches and historical places. All pictures looks amazing and elephant safari is one of the best part in Sri Lanka. Wow, Great Post! I can’t wait visit to Sri Lanka it’s my favorite destination. i’m going to Sri Lanka with my best friend this year and I’ve been doing lots of research. Great photos and an even better greater guide!! Thanks for sharing. Wow, what a great post! Some wonderful photos too. Really like the rock fortress. Thanks for sharing it! Wow! I like your trips…What a wonderful blog post. Great experiences and adventures. Every pictures looks so beautiful. Thanks for sharing it. Sri Lanka has a great history. Thanks for sharing Sri Lanka.As you said, there is not much information about there. I was searching it and could not find where to stay or what to do.So your article is very informative for me. As I like history, visiting Dambulla cave temple can be interesting for me. Also elephant safari can be fun. Being in nature is relaxing. Great information, Sri Lanka is on our list so thanks for this post. Of course, no problems. Thanks for sharing! Great post. How did you move from colombo airport to your hotel? by bus or car. It seems it’s a great place to visit. I like it.